A great place to be on a hot summers afternoon just might be in the shade under a great big oak tree or in your darkened, air-conditioned living room listening to classical music as you strive to calm down the kids. This might be a good book for actually making that happen. Full of animal yoga poses, this book is both healthy for the body and fun. Did you know that Yoga is beneficial for kids? First, it teaches them healthy breathing patterns and secondly, it teaches them body awareness (if you're familiar with sensory processing in children, you'll know this calms them down as well. Hooray!) For a easy-to-read handout on this, try this link (click here). Activity: Read through the book together (yes darken those drapes and turn on that music). 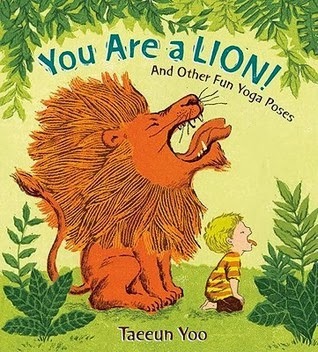 Have fun posing like the different animals in the book and practice breathing, counting 1-10. Have them do the counting with you. Then let them decide different animals you can pose like. Have fun either relaxing in the few minutes of peace you might have or giggling as you try and mimic each other and the animals in the book.